Pesto is making a comeback in my kitchen. 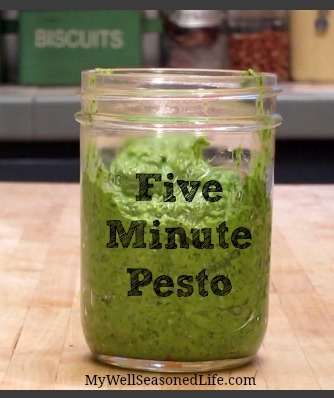 And this five minute pesto is the best. I was inspired by a recipe that I found on Serious Eats. I’ve changed it up a bit and found that Trader Joe’s is a one stop shop for the ingredients you’ll need. I’ve dispensed with the mortar and pistol and use my food processor. I’ve been using pesto on radish pesto crostini, on pasta and soon you’ll see it on my cauliflower pizza. Here’s a video that takes you through the steps. Valentina thanks so much for stopping by to check out my pesto recipe. And yes it’s a one stop shop recipe that happens to be delicious. Summer and basil pesto. Yum, Put on everything. Love the radish crostini idea. Thanks Judy. Thanks for stopping by Patricia. Christina, I suffered pesto overdose during the 80s. But I really like this one. and it’s super easy and stays in the frig for up to two weeks. I’ve been putting it on everything. Thanks for stopping by. Looks like another winner recipe Judy. I like that it’s half spinach because all basil is strong for me. I’ve had luck freezing extra pesto in ice cube trays, then transferring to a ziplock bag. It’s a great way to have small portions handy. Just pinned! That’s a great idea to make pesto ready when you need it. Thanks so much Dana. No more excuses not to make pesto with this recipe! Yum!